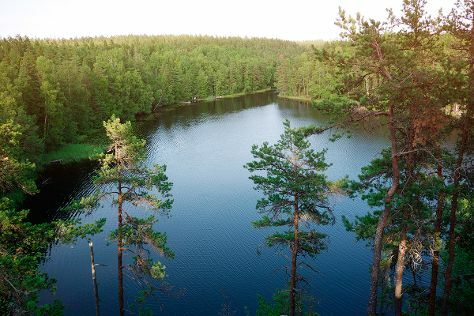 Step off the beaten path and head to Teijo national park and Nuuksio National Park. Get in touch with nature at Tulliniemi Nature Path and Hagen - Ramsholmen - Hogholmen. Explore Helsinki's surroundings by going to Ekenas Archipelago National Park (in Raseborg), Pyhan Katarinan kirkko (in Karjaa) and Vantaa (Sipoonkorven Kansallispuisto & Heureka, the Finnish Science Centre). Pack the 8th (Mon) with family-friendly diversions at Linnanmaki Amusement Park. There's lots more to do: browse the exhibits of Seurasaari Island and Open-Air Museum, explore the striking landscape of Torronsuo National Park, get a new perspective on things with Boat Tours & Water Sports, and identify plant and animal life at Laajalahti Nature Reserve. To see maps, other places to visit, traveler tips, and more tourist information, you can read our Helsinki itinerary planner . Montreal, Canada to Helsinki is an approximately 13.5-hour flight. You can also do a combination of train and flight; or do a combination of bus and flight. Traveling from Montreal to Helsinki, you'll lose 7 hours due to the time zone difference. Plan for little chillier temperatures traveling from Montreal in July, with highs in Helsinki at 25°C and lows at 15°C. Wrap up your sightseeing on the 20th (Sat) early enough to travel back home.